Asus has announced the eye-catching and ultraportable Pro B9440 notebook for business. At 2.3 pounds, Asus says it is the world's lightest 14-inch laptop. 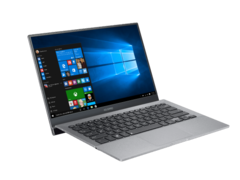 Asus is looking to turn the heads of business jet-setters with the new Asus Pro B9440, a 2.3-pound, 14-inch, Kaby-Lake-powered ultrabook with MIL-STD810G certification. The impressively thin and light Pro B9440 will still offer full Core i5 and i7 U-series chips—not the rebranded 4.5W M-series. The notebook will support up to 16 GB of ram and a 512 GB SSD, but based on the design, likely won't have much upgradability or ports. Asus says the battery will last up to 10 hours. It isn't clear exactly how thin the device is, but it has a rather unique design where the top half is more substantial than the bottom. When opened, the bottom of the display elevates the keyboard significantly for (presumably) better cooling. The screen seems to have the ports, while the body just has a 3.5mm audio jack. It's also worth noting the XPS-like extremely slim bezels. The Asus Pro B9440 will start at US$999 and officially launch in May of this year.